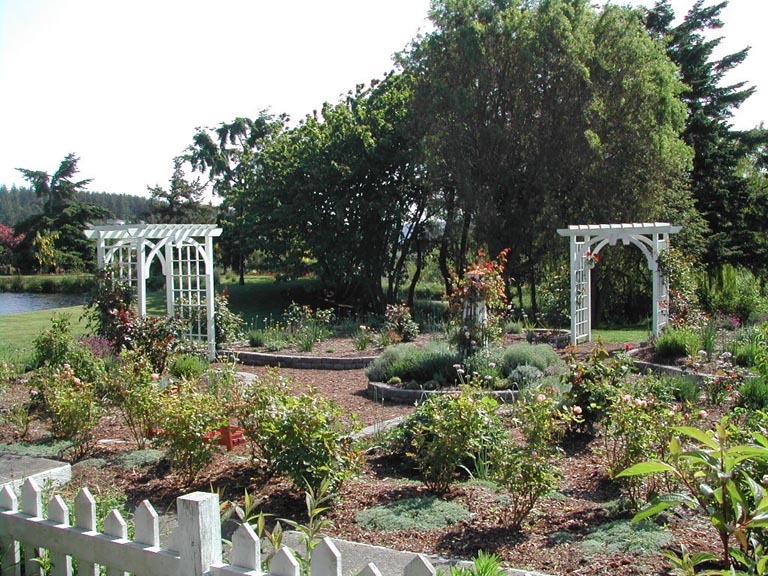 The design for the rose garden comprises four color zones: white, pink, red, and yellow. Herbs and lavender interspersed with violas, an herb garden in the center, pathways, and arbors complete the plan. Along one edge of the garden is a rose hedge planted with a pink shrub rose that blooms throughout the summer. Show that selected roses can be grown successfully with minimal maintenance by practicing integrated pest management methods in an organic environment. Display examples of many types of roses, including hybrid tea, floribunda, grandiflora, rugosa, polyantha, shrub, climbing, species, and standard. Show that herbs such as lavender, rosemary, and alliums can be used as animal pest deterrents and serve as attractive companion plantings. Display a rose garden that reflects a 1900-era sensibility. Demonstrate a relatively small-space herb garden. Warriner/1993 Medium red, Large-Flowered CI.